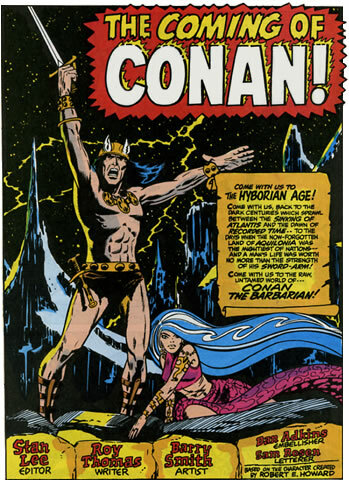 This page of Conan is copyright---of course---Marvel Comics. Roy was Stan Lee’s first staff writer in the early years of Marvel Comics. Over the years, Roy wrote everything from Millie the Model to Sgt. Fury and His Howling Commandos and X-Men. After Stan become publisher, Roy became Marvel’s editor-in-chief. Later, after Roy left Marvel, he wrote a lot of great comics such as All-Star Squadron, Justice Society of America, Wonder Woman, and the fun and very funny Captain Carrot and his Amazing Zoo Crew. Plus…oh, heck. Look it up. It’s an incredible body of award-winning work. I’m thrilled that Roy took time away from editing Alter Ego Magazine and everything else he does) to write a bit of Last Kiss.